To prepare to use the tool, we first had to insert two AA batteries. 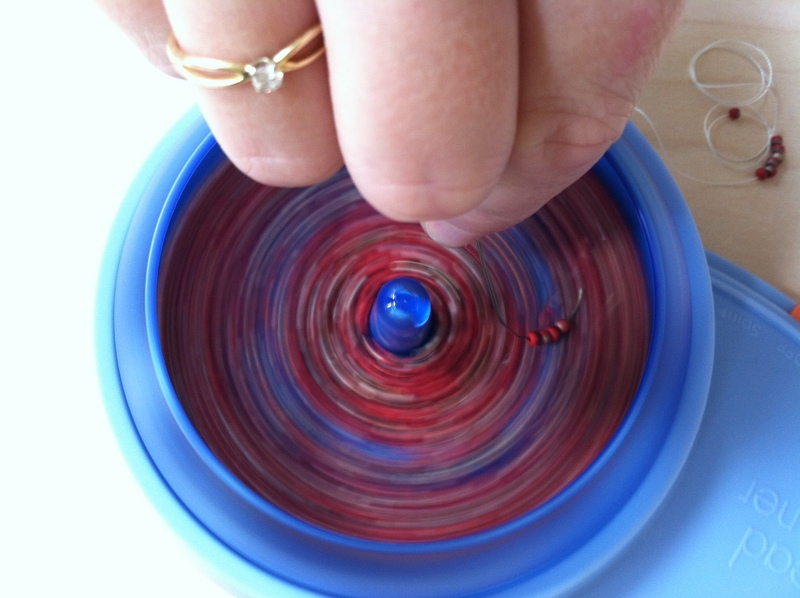 Then we filled one of the bowls (the spinner comes with three) with seed beads. The instructions say to fill the bowl one-third to one-half full–the more beads in the bowl, the easier it's supposed to be to string them. Then we threaded the included large curved needle with some of the included thread. We were ready to start the machine! I turned on the spinner, then inserted the needle into the bowl. Beads started spraying out of the bowl, not staying on my needle! Discouraged, I thought I needed a little better instruction, so I viewed the YouTube video the company put out. Not too helpful as it's hard to see the beads and needle in the video. I returned to the spinner. This time I held the needle a little closer to the curve, and concentrated on skimming the surface of the beads, not poking the needle into them. Better. I got a few beads on my needle. Kate tried. After the needle wiggled back and forth, she was able to stabilize it and get an inch or so of beads on the wire–progress! The instructions do warn that it may take a bit of practice to find "just the right 'touch'" to pick up the beads. We found this to be true. After several tries, we were able to get more and more beads strung at a time, though no nowhere near two inches at a time–the amount at which the instructions suggest you push the beads down the thread. We agreed, however, that it was worth playing with the tool more. Have you used a bead spinner? If so, please share your tips! How Do You Like Your Herringbone?